Get authentic Chinese-Style Pork Stir-Fry in a flash with this recipe. 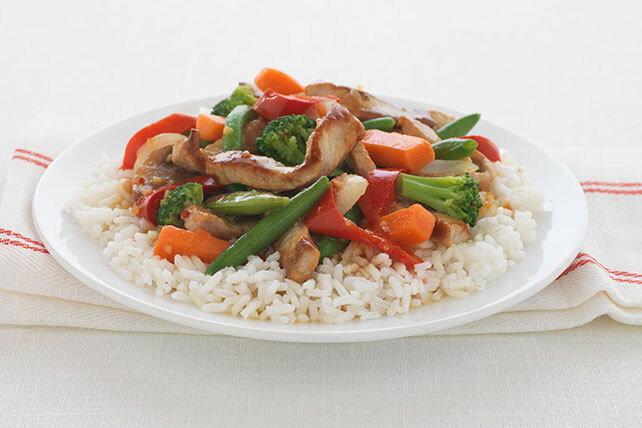 In just twenty minutes you'll be enjoying the honey and ginger of our pork stir-fry. Heat oil in nonstick wok or large nonstick skillet on medium-high heat. Add meat; stir-fry 5 min. or until done. Add all remaining ingredients except rice; stir-fry 5 min. or until heated through. If you have leftover cooked veggies in the refrigerator, you can use them to prepare this tasty stir-fry instead of the frozen mixed vegetables. Or, you can use pre-cut fresh stir-fry vegetables purchased from your supermarket - just stir-fry until crisp-tender before using as directed. Substitute long-grain brown rice or spaghetti for the white rice.